Peter Said, "You are not lying to men, but to God." When Ananias heard these words he fell backward and died. HE PEOPLE WHO now worshiped with the apostles numbered about five thousand, many times more than those one hundred and twenty who were together praying on the morning when the Holy Spirit was given. This throng of believers met to worship God on the porch of the temple, called Solomon's porch, where Peter had preached after the lame man was healed. In all this great number of people the selfish spirit was not shown. Some had little wealth, and others had none. Still others had plenty and enough to spare. Those who had plenty share with those who had none, and every one's needs were supplied. Love in their hearts for their fellow men caused the rich to be kind to the poor, and to take care of them as if they were needy brothers. Many of the rich sold their houses and their farms. Then they brought the money to the apostles to divide among the poor people who worshiped with them, that none should need to be hungry or left without shelter. In the company of worshipers were a man and his wife whose names were Ananias and Sapphira. These people saw the others bringing their money to the apostles and they decided to sell their property also. But they did not want to give all the money to the apostles. Now, the tempter who came to Adam and Eve in the Garden of Eden whispered to this man and his wife. They listened, and he said: "Sell the property if you wish, but keep back some of the money, and say that you are giving it all. Peter and the other apostles will believe that you have given all just as the others are giving their all, and they need not know you have kept back a part of yourselves." Ananias and his wife thought the plan was a good one. They agreed together to tell the apostles they had brought all the money. And when the day came Ananias hurried to the apostles, carrying his bag of gold. Now it was wrong for them to keep back part of the money, and then pretend to give all. God saw the desire in their hearts to deceive the apostles and appear very self-sacrificing, and he was not pleased. 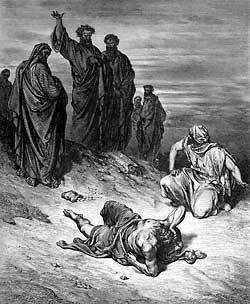 Ananias brought his bag of gold to the apostles and laid it down before them, saying he had sold his property and had brought the money to them. A guilty feeling stirred in his heart, but he looked at the apostles, expecting them to praise him for his self-denial. Instead of praising him,, Peter looked squarely at him and said, "Ananias why as the tempter filled your heart with the thought to lie to the Holy Spirit and keep back a part of the price? While the money was in your hands it belonged to you and why have you thought to deceive us by pretending to bring all when you have really brought only a part? You are not lying to men, but to God." When Ananias heard these words he fell backward and died. And the people who were present feared greatly, because they saw what a terrible thing it is to try to deceive God. Some young men who were sitting near by rose up and took the dead man's body away to bury it. Three hours passed by, and Sapphira, not knowing what had happened to her husband, came into the room where the apostles were staying. Peter saw her and knew she was Ananias' wife. He called her to him, and she came forward, possibly expecting him to praise her for the self-sacrifice she and her husband had made. But Peter did not look pleased. He asked, "Did you and your husband sell your property for this sum of money?" She saw the amount, and she answered, "Yes." Then Peter said, "How is it that you agreed together to tempt the Spirit of the Lord? The feet of the men who buried your husband are at the door, and they will carry you out also to your grave." Sapphira fell down before Peter when she heard these words, and died on the same spot her husband had died on. And the young men came in, picked up her body, and carried her out to bury her beside her husband. Great fear came upon all the other people of the early church, and upon those who were not believers in Jesus. And every one was afraid to pretend to be numbered among the believers unless he really knew his sins had been forgiven.